The Rio Texas Annual Conference has made it a priority to use video conferencing to facilitate our work together. This annual conference covers an immense geographic area. Meeting to do our important mutual work is expensive in time and money. As I have written before, there is great value in meeting face to face. However, limiting ourselves to face to face meetings becomes time and cost prohibitive and limits our ability to have all voices represented in planning and decision making. When I arrived at the conference in February, we had conference rooms set up for video conferencing but the system was rarely used. We were using Adobe Connect, which is an excellent platform but a little complicated for the average user. We made some major changes right away. The setup we are currently using is light, easy to use, and affordable. If you are thinking of setting up a simple video conferencing system at your church or organization, you can use the same setup. Zoom is a cloud-based video conferencing platform used by over 140,000 companies. Zoom is available at a number of price points for different types of users. Zoom offers a free account for users who are okay with meetings limited to 40 minutes. Zoom also offers pro, business and enterprise accounts which removes the 40-minute limit and add additional features. This is an amazing little camera for the price ($99 retail, currently $53.99 on Amazon.) It offers 1080p, H.264 encoding and Zeiss optics. For non-techies, that means that the image looks really nice. It doesn’t have the mechanical remote pan, tilt, and zoom of more expensive cameras but Logitech’s software allows for digital pan, tilt and zoom (if you are on a PC – on Macs, you have to use third-party software.) The viewing angle is excellent so you can get everyone in the shot, it works well in a variety of lighting conditions, and it has built-in autofocus. The camera has a neat mount that works if you are setting it on a table, hanging it from a monitor or attaching it to a tripod. It even has a built-in microphone which may work fine for smaller groups and smaller rooms. One of the problems with setting up video conferencing in existing conference rooms and offices is wiring. The camera is usually easy because it is usually near the display and therefore the computer. You can just plug it in. However, it is desirable to have microphones as close as possible to the participants. This usually means long, ugly cables that people trip over. Bluetooth solves that problem. This little device will pair with any computer (or mobile device) with Bluetooth. If you are using a computer without Bluetooth, you can buy USB adapters for about five bucks. (You can also plug it in via USB.) Once the speaker is paired, it offers loud and clear sound and the microphones inside can pick up voices from every side. It is best suited for offices and smaller conference rooms. However, we are currently using one on our large meeting room. It can be a little hard for users on the other end to hear people at the far end of the room but for $149.00 retail and no installation costs, this little circle is amazing. Zoom’s meeting client is a very small program. They list the system requirements at any 1 Ghz single core processor or better. That is true but you might want to have something a little better than that, especially if you are one to run other programs at the same time. However, you don’t need to go out and buy a top-of-the line PC or Mac to make it work. We run ours on PCs because that is what we have and we have a lot of demand for Excel and Powerpoint. If I were starting from scratch, I would be really tempted to run on a Mac Mini. You just need something with a couple of USB ports and a way to connect to the internet. Three of the conference rooms we use have large, flat screen TVs. The fourth has a ceiling mounted projector. What you use really depends on your budget and the size of the room. I have seen setups where a laptop’s screen is the display. I have also been in conference rooms where a 32″ TV sits right on the conference table. The only thing that is essential is that you have a way to hook the computer up to the monitor. Some TVs have VGA connections. Newer models might be limited to HDMI. The good news is that there are adapters for just about everything now. For group video calling: 600kbps/1.2Mbps (up/down) for HQ video. For gallery view: 1.5Mbps/1.5Mbps (up/down). This can be a little confusing since most internet providers advertise their maximum speeds, not their minimum. Your provider might tell you that you are getting 1.2 Mbps and, sometimes you might. However there may be times that the number sinks down to a point where it starts to affect the quality of your call. And there are other factors. Your internet is only as fast as your weakest link. You might have 50Mbps internet but be connected via WiFi. If you are in a part of your house or office with a weak signal, you might be getting barely any bandwidth. Also, you never know when someone else on your network might be using a lot of bandwidth and slowing you down. It is always a good idea to check. From any computer, you can go to speedtest.net and check your actual internet speed. Honestly, you don’t need to spend much money at all to get started with video conferencing. You can use Zoom for free and use it on your laptop, smartphone or tablet. There are also plenty of other services out there: Skype, Facetime, Google Hangouts. The only reason to invest more is to get more buy in. Some people like living on the bleeding edge of technology. They don’t mind fiddling with the equipment and don’t get frazzled if the meeting disconnects. Others prefer to work in a more conistant environment. There are also some situations that require everything to work, work well and work the first time. Some minor equipment upgrades can create a better experience for everyone. For more on video conferencing, check out my post. 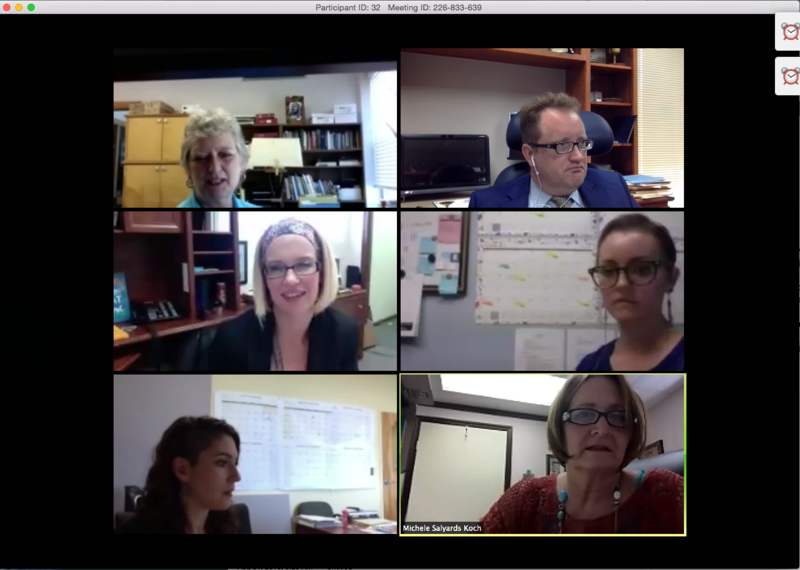 Video Conferencing and Pastoral Care.